Spray muffin pans with nonstick cooking spray or line with paper baking cups (2 1/2- inch; 18 count). Place one piece of broccoli in each cup. In a large bowl add muffin mix, onion, cheese, eggs and melted butter and stir just until combined. 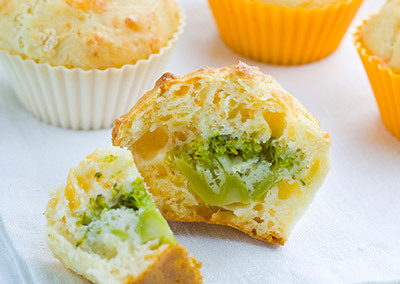 Fill greased muffin cups (or paper baking cups) three-fourths full covering the broccoli. Bake for 20 to 25 minutes or until a toothpick comes out clean. Cool for 5 minutes before removing from pans.